Over the last few years there have been prophetic declarations at Bethel Church that have helped shape Casa de Dios. These are declarations that we have received in faith, prayed over and seen God fulfill in wonderful ways. We continue to believe in the work that He is about to do for He has declared it. We will continue to share prophetic words with the Body of Christ. Here you can find four key ones. The first is over Bethel Church (2009), the second over the City of Bryan (2010), the third was given over the phone to the bilingual congregation on August 8th, 2011, and the fourth over the Brazos Valley (2011). May the Lord give us discernment as we continue to seek His Face for the City, BV, Texas and our Nation. "I decree a New Day, I am MAKING ALL THINGS NEW. As you surrender I am giving grace to leave things behind and embrace double fruitfulness. I have been at work in the hearts of My people, called by My Name to manifest My Name in Bryan/College Station. You have had many great challenges in the past 15 months, but there are great miracles, great deliverance and great purpose for the faithful ones. Do not surrender/focus on your past failures. Look unto Me, what I am building, what I am doing in your midst. Be a co-worker, a participant and you will receive a great reward - Double fruitfulness for the next generation. 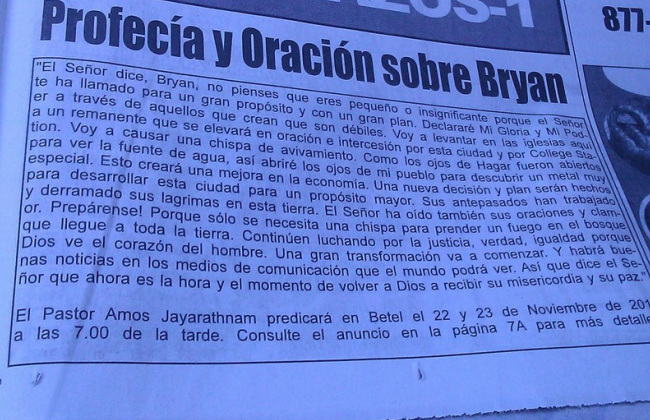 The Lord says, Bryan, do not think that you are small or insignificant. For the Lord has called you for a great purpose with a great plan. I will declare My Glory and My Power through those who think they are weak. Among the churches here, I am going to raise a remnant to rise in prayer and intercession for this city and for College Station. I will cause a SPARK of revival to break out. As Haggar’s eyes were opened to see the spring water, so also I will open the eyes of my people to discover very special metal, etc... to be seen, which will boost the economy to rise. A new decision and plan will be made to develop this city for a greater purpose. Your forefathers have toiled and shed their tears on this ground. The Lord has also heard their prayers and cries. Get ready! Because you only need a spark to have a forest fire and it will ripple throughout the land. Continue to stand for justice, righteousness, truth, equality, because God sees the heart of men. A major transformation is about to begin. I will cause the good news to be in the media that the world can see. Therefore the Lord says now is the time and the hour to return to God, to receive His mercy and grace. Transcription of Prophecy given to Bethel August 2011 before the 3 day revival conference. 'Examine your lives over the last 5 to 10 years to start to understand your talents and calling, make a decision and focus on your role to serve the Lord Each person has to identify his/her role, talent and gift for the revival to continue. I see in the spirit the river of Ezequiel 47 that brings healing. The river will come when we use the gifts that we have and pray for the church, the region and the nations. The river will rise and there will be miracles and signs in this place. He wants to do it Now. Do not focus on your situation. If you rise up and push through I will heal you and I will heal other people through you. There are people outside who need healing. Many people are hurt inside and outside the church. The devil has deceived many who have kept to their own kingdom things. It is time to rise up. The Sun (but in this case I believe is also Son) of Righteousness will rise up as in Malachi 4 1-6 ( "For behold, the day cometh that shall burn as an oven; and all the proud, yea, and all that do wickedly shall be stubble. And the day that cometh shall burn them up," saith the LORD of hosts, "that it shall leave them neither root nor branch. 2But unto you that fear My name shall the Sun of Righteousness arise with healing in His wings; and ye shall go forth and grow up as calves from the stall. 3And ye shall tread down the wicked, for they shall be ashes under the soles of your feet in the day that I shall do this," saith the LORD of hosts. 4"Remember ye the Law of Moses, My servant, which I commanded unto him in Horeb for all Israel, with the statutes and judgments. 5"Behold, I will send you Elijah the prophet before the coming of the great and dreadful day of the LORD. I give strength to my people to destroy the enemy. Sons will be restored to fathers and fathers to sons. There is going to be a shaking in the structure and leadership so that every person will be placed in his/her right right place. From now onwards some of you will see dreams, visions, wonders and signs. This fellowship will continue to always look into the community to see how we can help and minister. Do not fear, the anointing is in you, the Holy Spirit is in you and I will cause a stirring to take place. Some will experience a financial explosion. Some will experience inner healing. Some will experience seeing your loved ones come back to the Lord Do not fear, says the Lord, my grace is upon you, you are my bride I want you to experience my glory. Thus says the Lord"